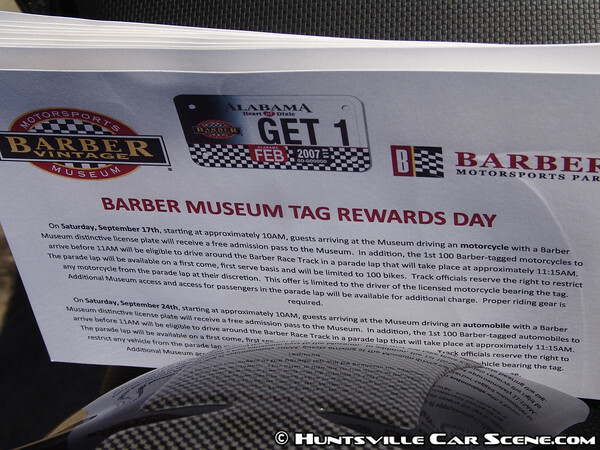 "On Saturday, September 17, starting at approximately 10AM, guests arriving at the Museum riding a motorcycle with a Barber Vintage Motorsports Museum distinctive license plate will receive a free admission pass for the museum. In addition, the 1st 100 Barber-tagged motorcycles to arrive before 11AM will be eligible to ride around the Barber Race Track in a parade lap that will take place at approximately 11:15AM. The parade lap will be available on a first come, first serve basis and will be limited to 100 bikes. Track officials reserve the right to restrict any motorcycle from the parade lap at their discretion. This offer is limited to the driver of the licensed motorcycle bearing the tag. Additional museum access and access for passengers in the parade lap will be available for additional charge. Proper riding gear is required." Sounds like a really cool reward for just having a tag.